I am such an apple pie lover. Apple pies and apple tarts are something I could have every day for dessert in many different forms, and I wouldn’t get bored. I do however get bored of eating a good old fresh apple. 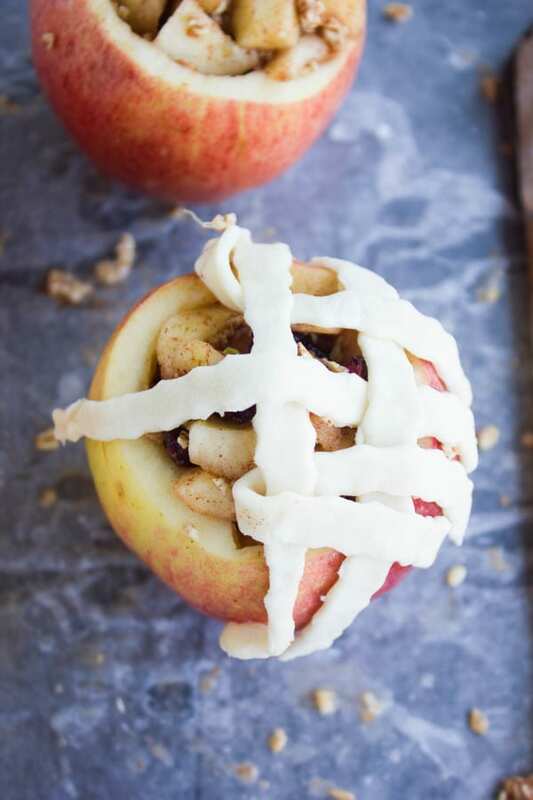 Baked apples though—never. There’s something about tender baked sweet soft apples, which are often paired with cinnamon, and most often paired with a flaky buttery crispy pie dough that makes apple pies so irresistibly good! 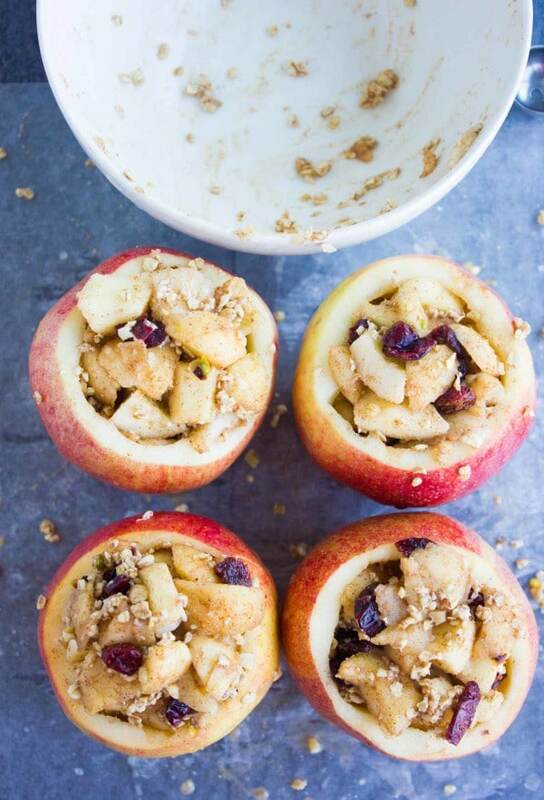 These Apple Pie Stuffed apples are the guilt-free version of all the above. They are so satisfyingly yummy that you won’t miss out on the original. The only difference is they have more of the apple taste versus the dough taste. That’s why I should rephrase, so you won’t miss out on the original but you will miss out on the guilt after enjoying your apple pie ever so generously. 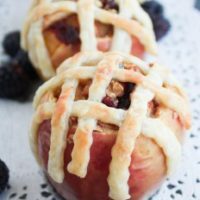 For this Apple Pie Stuffed Apples recipe, cored apples are stuffed with the diced apple filling mixed with blackberries and apple pie spice. Then topped with a buttery flaky lattice pie dough and baked till sweet golden flakey crisp and perfect! 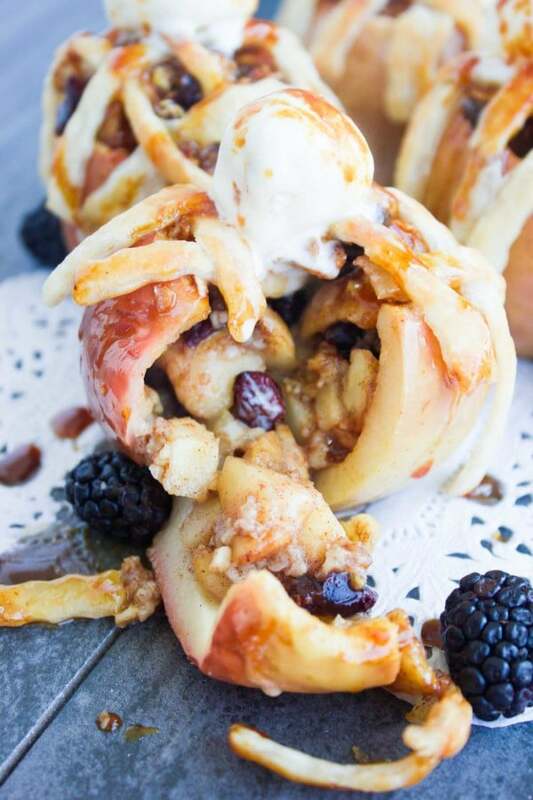 Do you remember my amazing baked apples with granola crunch recipe? 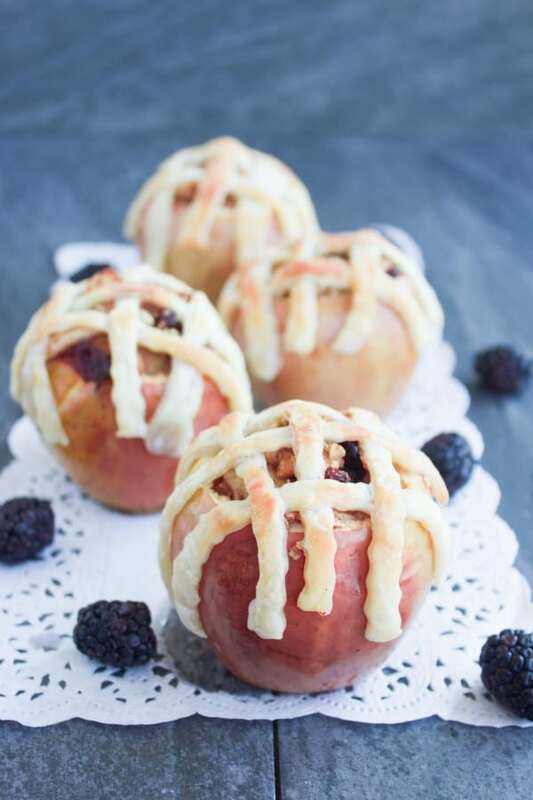 These apple pie stuffed apples are another way to really enjoy and share apple desserts with a healthy twist. It all starts by preparing a batch of this easy flakey pie dough—which is really what is claims: easy and flakey! 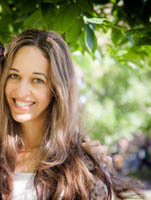 Then roll it into a rectangle and cutting it into thin strips—about 1/8th inch each in width. After that, it’s time to prepare the apples. They get sliced, cored and hollowed. This works best when using a melon baller leaving about 1/8th inch thickness along the borders. The apple pieces which were removed to hallow each apple are then chopped and mixed with a little bit of brown sugar, some blackberries or cranberries, some apple pie spice and a teaspoon of flour. Then this flavorful apple mix goes right back to stuff the apples again. The apple pie stuffed apples are now ready for the crust on top. 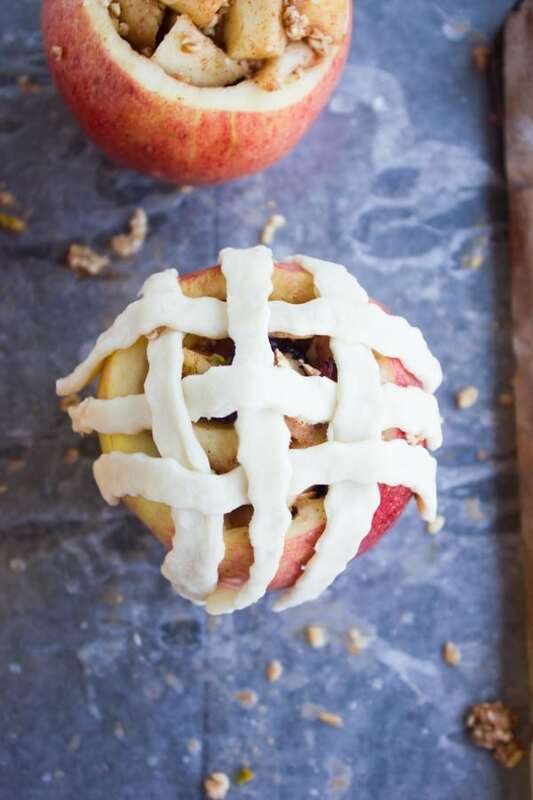 I love arranging the crust on top of the apples in a lattice, This is best explained in the photos below, but basically, it starts by arranging three strips in one direction. Then fold those three strips halfway towards one end making both ends of the strips meet on the same side. Take the fourth strip and arrange it perpendicular to the three other strips. Fold two of those three strips on top of the perpendicular strip and the remaining of the three strips below so it’s alternating. 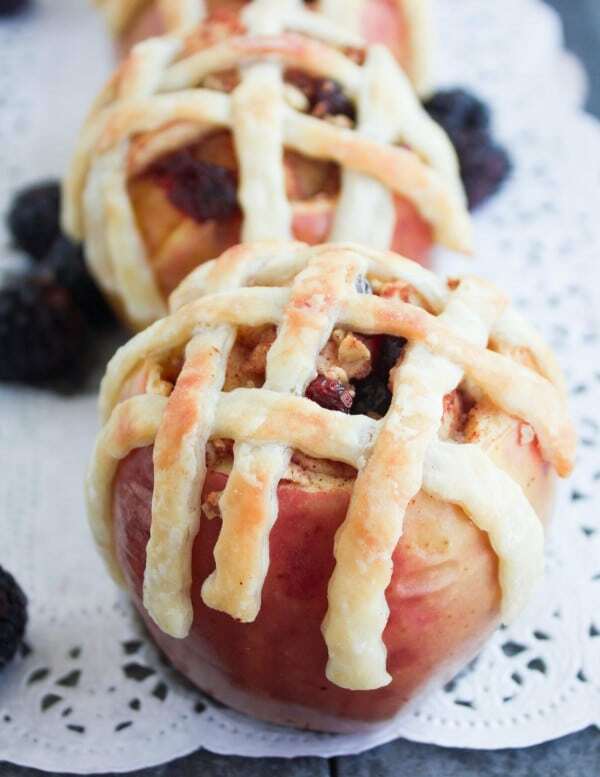 Finally, these lovely Apple Pie Stuffed Apples hit the oven and bake for 25 minutes until the apples are tender sweet and the pie pastry is golden crisp. 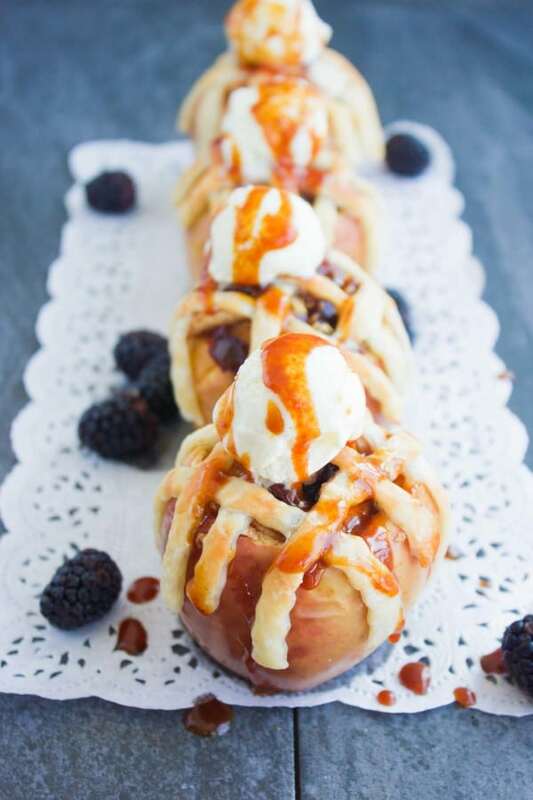 I love finishing the Apple Pie Stuffed Apples off with a dollop of vanilla ice cream and a nice drizzle of my homemade caramel sauce. 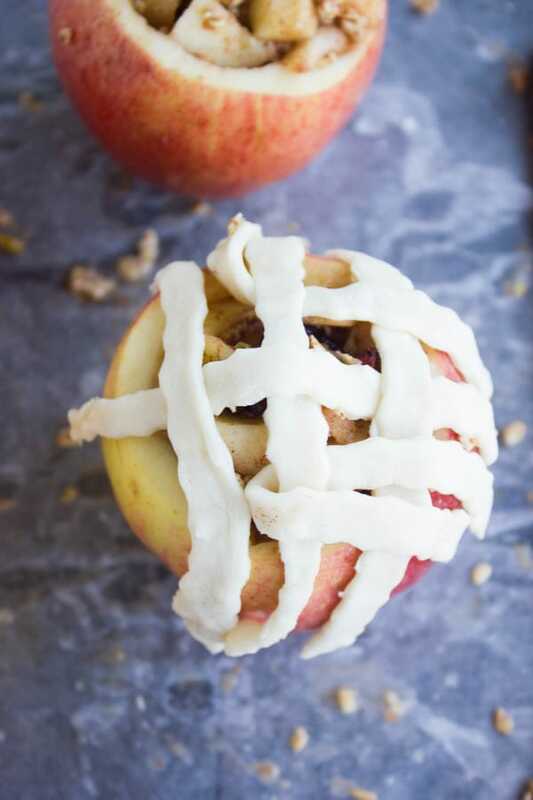 If you want to make this Apple Pie Stuffed Apples recipe gluten-free or vegan, use gluten-free/vegan pie dough on top. 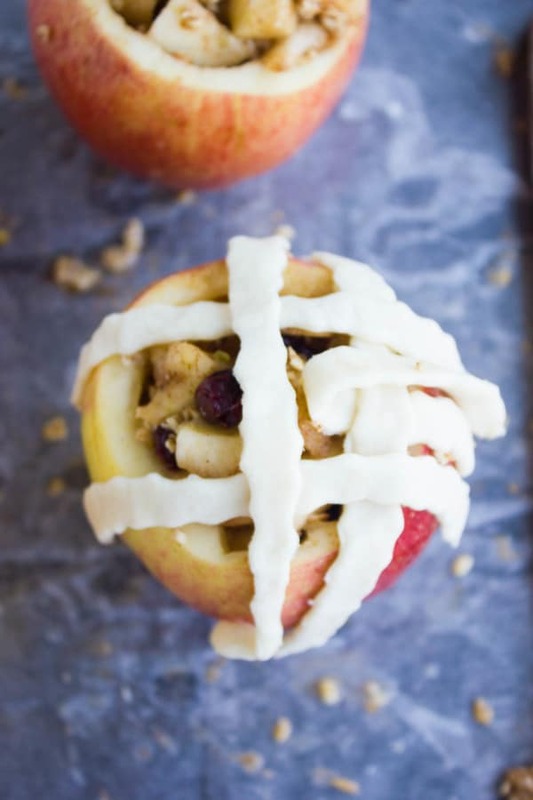 Alternatively, skip the dough part altogether and just bake the apples with the apple pie stuffing. 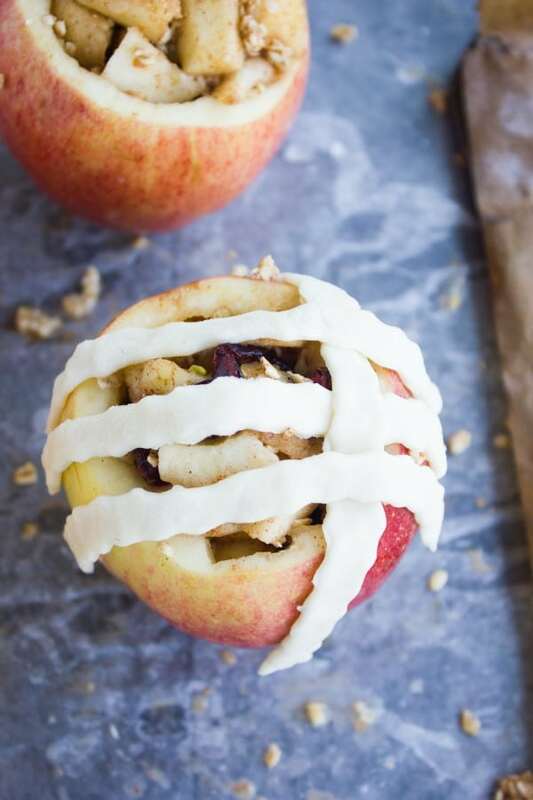 These Apple Pie Stuffed Apples are every apple pie lovers wish come true—the whole flavor of apple pie but with half the calories and absolutely none of the guilt. 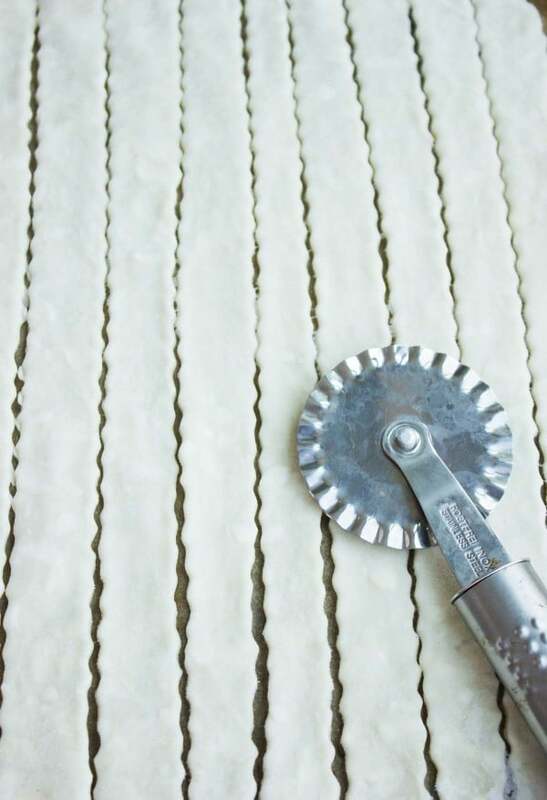 Prepare the easy flakey pie dough and roll it into a rectangle 1/8th inch thick and slice it into strips about 1/4 inch wide. 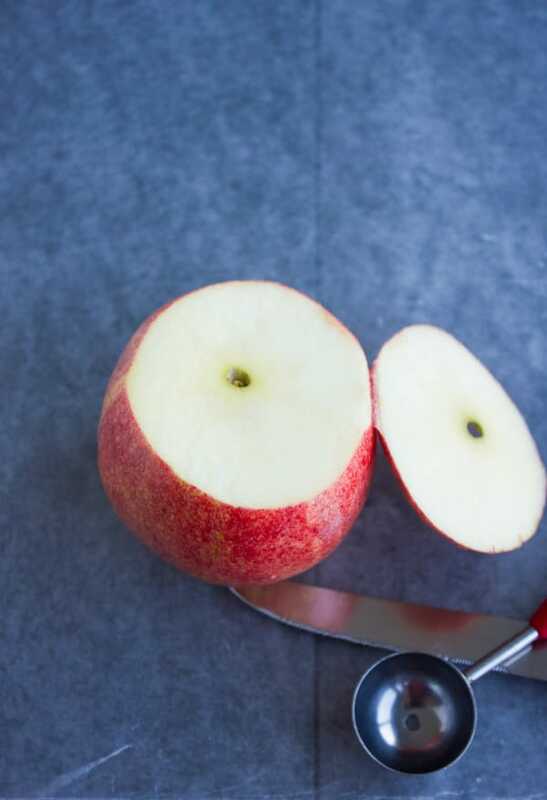 Slice each apple top and use a melon baller to hollow out as much of the apple as possible leaving about a fourth of an inch border around the apple. 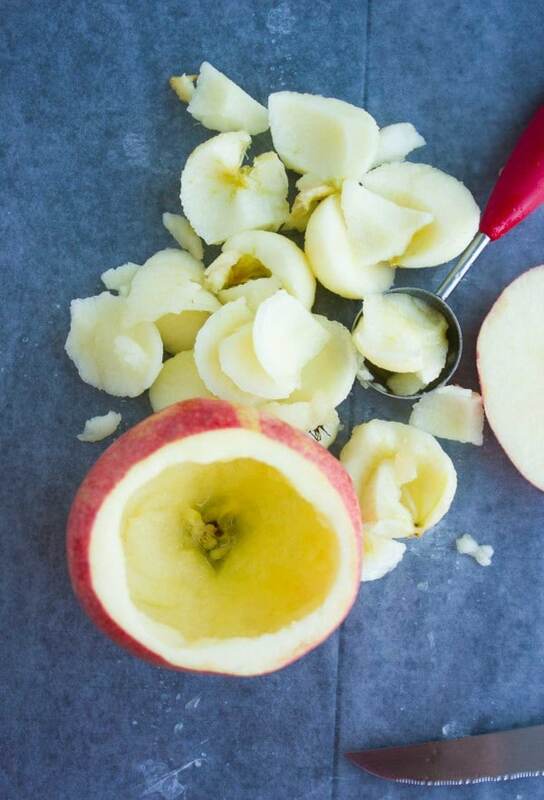 Take the hallowed apple pieces, remove any seeds, and start chopping up the apple into tiny cubes about 1/4 inch. In a bowl, toss the apple cubes with the cranberries, blackberries and nuts if using and add in the brown sugar, flour and lemon juice. add the cinnamon and ginger and extra spice if desired. Take this apple mixture and stuff it back into the apples. Now to make the lattice topping, it’s best to look to the photos. Take three strips and place them horizontally on each apple. Fold them back towards the edges making room for a vertical strip to land in the middle perpendicular to them. Then take two of those three strips and fold them onto the vertical strip, and the remaining one strip below the vertical strip creating an alternating weave like arrangement. Repeat with three more vertical strips. Bake the apples for 25-30 minutes until the crust is golden brown and apples are tender. 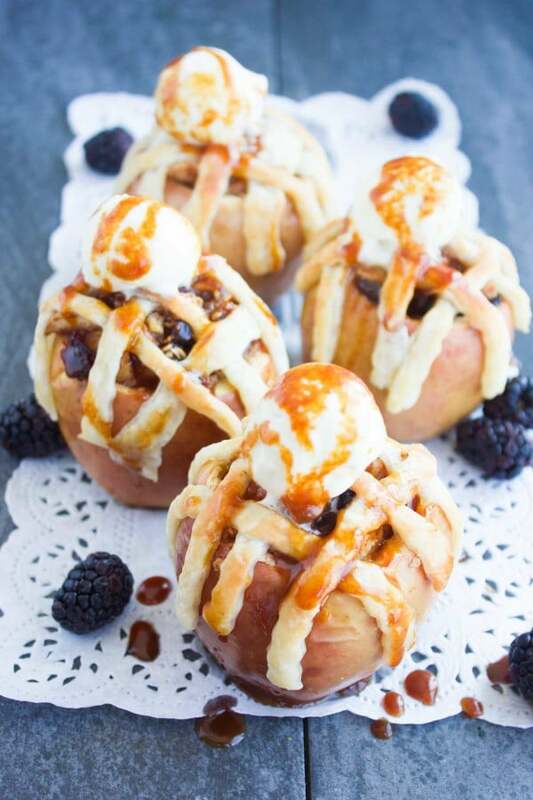 Serve with a dollop of vanilla ice cream and caramel drizzle if desired. I am so excited for apple season!! 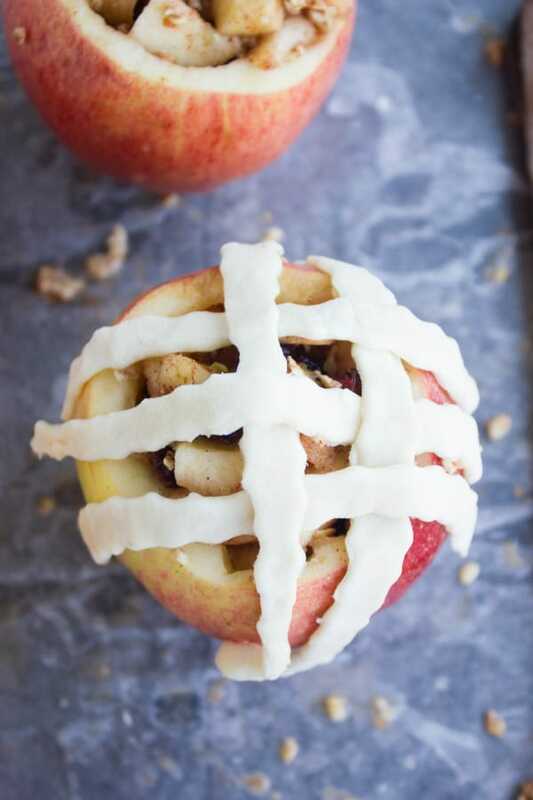 Love this healthier version of apple pie! Aww, those are so cute. Love the idea. So simple and easy as well. Would be the perfect individual serving for Thanksgiving. I love apple pies and this is double treat. 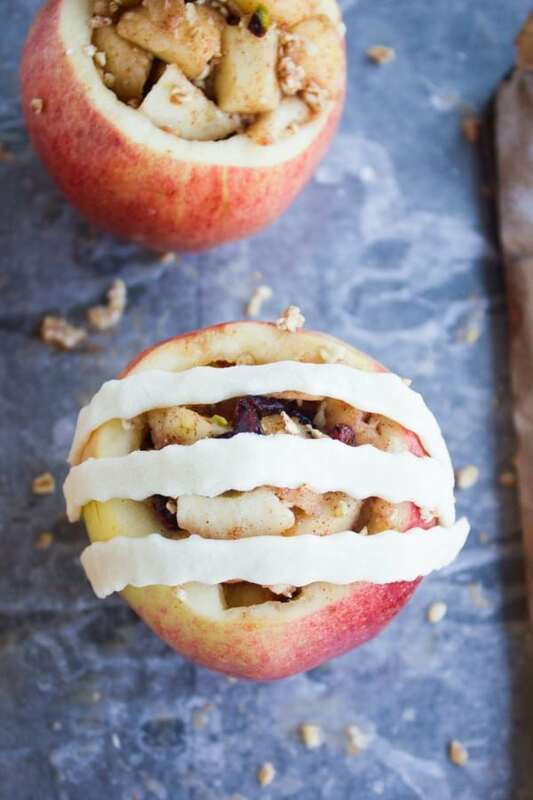 Apple pies stuffing in apples! Brilliant! and this looks and sounds so interesting. Wow, I can’t wait to check your other fall recipes. Saving this one for later. Sounds yum. How cute!! 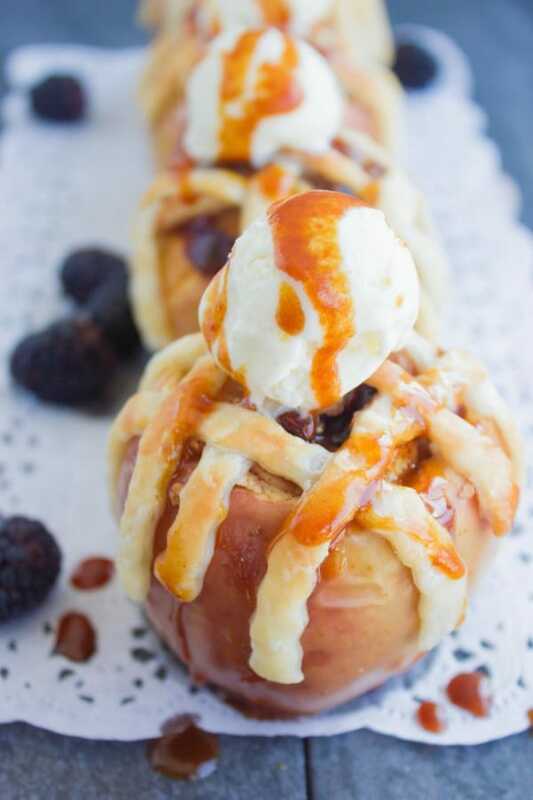 I love individual desserts and this reminds me of apple dumplings only without all of the crust. Although I do love crust I also like saving some calories but still having the taste. This is perfect. I love freshly baked apple pie and I don’t feel guilty about it at all. These look and sound great, I think my hubby would really enjoy them.